The official 5.0 release will be ready in a couple of weeks time for general testing. Until then an unofficial patch is available here. Designed to give visual or audible cues to the user in response to in-game events, such as gaining buffs or debuffs. Types of cues range from simple texture displays to stack counters, timers to timer bars, and are fully user-configurable. Can be animated or have sounds attached as well. Tutorials will be written and linked here soon, stay tuned! Go to the CurseForge site and Submit a Ticket. Please do not suggest features via the ticket system, and instead use our UserVoice forum. If you do submit a ticket, we will reply if more information is requested. If no additional information is given in response, we will mark the ticket as Invalid. Feature suggestions are immediately marked invalid. There is a UserVoice forum for adding and discussing new features. Submit all feature requests here, but please do not duplicate requests. Duplicates will be exterminated. Painfully. We're always looking for a helping hand. You don't need to be an expert coder to help us out, we've plenty of things that need people to oversee. Of course, knowing code has some benefits - ever wanted to get a feature implemented? Maybe fix a pesky bug that we said we'd fix two months ago? Now's your chance! See your name in lights in the release notes! Contact me here via a PM or email me sammackrill[AT]gmail.com. Fixed an issue with linked auras where multiple auras in the chain are disabled. Probably. Fixed a large amount of debuff ID types. Fixed divide by zero issue with PowerAurasRole.lua, and any other possible issues with Health/Power type auras. Fixed a possible issue with the stances dropdown not filling correctly. Added Invert Timer support to Totems. That's right Shamans, I love you. Limited Strata support has been patched in, there's no configuration element for this (it's unsupported). To change the strata either export an aura, modify the export string (add "strata:LOW;" to the end, replacing LOW with the desired strata) and reimport, or modify your saved variables. Aura #182 was missing. This has been rectified. Fixed a bug with chat output when a sound file was loaded and played but the API said otherwise. Aura glow defaults to off. Updated tooltip for Pet Stance type. This release is 4.2 compatible. Added Pet Stance activation type, which will activate if your pet is in Aggressive/Assist/Defensive/Passive mode. Minor changes to Blizzard options UI, to compensate for the ridiculously large amount of weight it put on. Pulse animation (while not in Old Animations mode) has had some minor changes done to it, it is now similar to the Blizzard one in terms of scale and smooths a little bit differently. These changes have effectively fixed the animation to prevent animations flickering. Buffs and debuffs are now properly checked on the whole group. Happiness auras are gone. Really now. If you had them, they'll be fixed, I PROMISE. Aura exports should fail less. This version has the codename "Yo dawg I heard you like updates". Blizzard bumped the client version number in their most recent fast patch which triggered some 4.2 PTR compatibility code to activate, this in turn may have inadvertently broken Spell Alert auras. Hence the fix. Holy Power should be working again, sorry guys. We didn't pick this up in the testing since there were no changes to the UI. Higher quality versions of Blizzard's spell overlay textures have been included, as well as some new ones. Multiple default settings have been modified, including but not limited to Locked/Unlocked Auras, Not Resting and Allow Inspections. The Pulse animation has had some improvements done to it behind the scenes. It's still broken as a result of the API changes. Text Auras have had their animations forcefully disabled until Blizzard fixes the animation bugs. Players using Spell Cooldown auras for pet abilities should once again find that their auras do not need the friendly target condition to be met. Spell Cooldown auras should no longer freak out if the spell is referenced as an ID number, but no longer exists. This release is compatible with the 4.1 patch, it is not backwards compatible with the 4.0 client. There are known issues with this release dealing with animations, these appear to be due to bugs within the animation API itself and the only known workaround is to switch on Old Animations. ADDED: A new option is available which will adjust the behaviour of the export system, if you were experiencing a bug where your aura exports were empty then you should enable this as a workaround. ADDED: Unit Match activation type. This is still a beta quality activation type and may not always perform as expected, please report any bugs through the ticket system on Curse. ADDED: Couple more debuff ID's. CHANGE: Action usable macro fix has been reverted, caused more issues than it solved. REMOVED: Animation FPS slider, as Blizzard has dropped support for this. FIX: Stacks work again, sorry guys! ADDED: Lots of class and engineering debuff ID's have been added, credit goes to Vaugn2 for assisting us greatly with this. ADDED: Ability to track Buff Type. ADDED: Stacks can now be displayed in their original sizing format - check the "Wider Digits" box to do so. CHANGE: Export dialog will now display a reason for transfer failure. CHANGE: Export dialog also now shows a timer, and correctly updates even if the dialog is closed. FIX: Spell Alert now functions properly with procs such as Lava Surge! FIX: Now works with the 4.1 PTR (there is an issue with animations on the PTR, use the Old Animations to bypass this). FIX: Auras should now initialize correctly and hopefully will not require a reload to work properly. FIX: Rare import bug regarding stacks has been corrected. FIX: Nil error on selecting custom texture checkbox. FIX: Stacks now scale properly. CHANGE: Stacks can now show absolutely any number of stacks - no limitation. FIX: Druid spammage - sorry dudes! FEATURE: 5 new aura textures from Dennis K.
- Feature: WoW 3.1 compatibility update. - Feature: Deathknight Presences added to Stance Auras. - Feature: Whitespace added to export strings to facilitate forum posting. - Feature: Better granularity for Mana/Health/Rage/Energy/Power threshold (step 5 -> 2). - Feature: Texture glow option affects timer. - Bugfix: Mana/Rage/Energy/RunicPower Party & Raid triggers. - Bugfix: Mana/Rage/Energy/RunicPower Unit triggers. - Bugfix: "Casted" -> "Cast" typo. - Bugfix: 'Show hundredths', 'Show 2 timers' timers options errors. - Feature: Option to only test buffs/debuffs cast by the player. - Feature: Dynamic texture update when multiple names and 'own texture' checked. - Feature: Import and export Aura-strings for sharing Auras with other users. 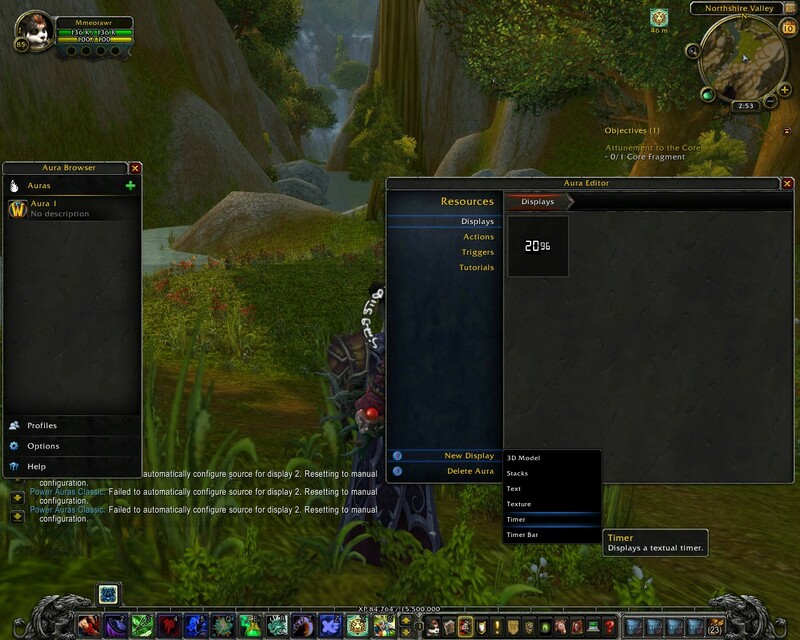 - Feature: 'Any' toggle for party and raid buff checks. - Bugfix: Action Usable aura when action linked to stance. and shutdown processing when unchecked. - Feature: Aggro warning from focus. - Bugfix: Invert Threshold gui bug. - Feature: Shadow option for textauras. - Feature: Ability to setup auras with combination of triggers. - Feature: Spell Casting activation trigger added (target and focus). - Bugfix: combination triggers with "show when not active" checked. - Bugfix: Font Select button not visible on first editor open. - Bugfix: Various internal logic errors/optimizations. - Bugfix: Begin Animation "replaying" when check/refresh auras. - Feature: Option to invert default threshold behavior added. - Bugfix: Threshold activation when Rage/Energy/Power is zero. - Bugfix: Fix gui bug 'Not in Combat' checkbox initial state. - Bugfix: Now hiding player auras when dead/ghost. - Bugfix: Stance detection is now dynamic so lower levels that don't have all forms/stances yet are supported. - Feature: Custom timer enabled for action usable. It overrides the calculated timers if used. - Feature: Rage/Energy trigger implemented with upper thresholds. - Bugfix: Buff and Debuff timers. - Feature: Custom textures can now accept SpellName or SpellID as valid input. - Feature: Updated zh-CN localization by <Doomiris>. - Bugfix: Buff and Debuff stacks. - Bugfix: Mana-threshold auras when shifting to bear/cat. - Feature: New custom sounds. - Feature: Option to use ability/spell texture instead of predetermined choice where available. named Auraxx.tga files in the AddOn folder and restarting the game. Works out of the box for all Action Buttons. they must be dragged to an action bar somewhere (doesn't have to be visible). Last edited by fydel : 01-01-15 at 03:35 PM. Everyone that used to use this should just switch to using "Weak Auras". I have been really debating finally removing this add-on and I decided to today since it had been practically unusable for almost a year now and there is only a single person trying to re-code it. Is anyone even still working on this to get it finished? If not I may just have to take up the mantle. about halfway down has a zip that can be downloaded as a working RC3 PA5...working for now tho. i have a bad feeling 5.2 may kill it for good. also ive noticed that it doesnt seem to like Macs just didnt want this file to get to burried. as someone obviously put alot of time into getting it right. MEOWRARRRRRRRR COME BACK AND SAVE US! If the project isn't dead: Can you allow us to make an Aura for Valor? I keep capping on accident... Already have auras to remind me of tradeskill daily cooldowns, this would be a natural addition. Should I just uninstall? or is an update coming before it gets broken again in 5.2? The official 5.0 release will be ready in a couple of weeks time for general testing. Needless to say I have little hope at this point but please correct me if I am wrong. At this point I am just wondering if it had been abandoned or at least why no beta release has been made in the 5 months since MOP hit. Seems like i'm completely lost on this, how can I get a test copy of v5? I love v5, but is there any ETA on a new beta or release candidate? Haven't seen or heard any news in quite some time. Now that parts of the last available beta version are breaking (adding new displays to an aura), it's more of an issue. Thanks again, and let us know what we can do to help! Specifically, what is the "Name of the API Event to listen to"? Would that be something I could have called in another AddOn altogether? It could for example be "PLAYER_TARGET_CHANGED", that is fired when you change target. I don't think it is possible to setup custom events outside of what Blizzards API provides, so as far as I know it isn't connected to other addons at all. When trying to create a new display, the menu opens, but is completely black with no text in it. Clicking on the empty menu does not do anything, so I assume the menu is broken. The auras work fine, but I can't create new ones, only edit existing ones. This may be a bit out there but it would be really awesome if someone could help me out. What I'm looking to do is set an aura to only show the graphic when all 3 of mortal strike, colossus smash, and overpower are on cd. I'm using V5 of power auras because I really like the interface and think its possible to do it with this version. They have a section for adding code for multiple conditions. Only thing is I have no idea how to code this in wow. Any one know how to set it up or what kind of code it uses? I believe its close to C++. Also maybe if you know a sight that has information on coding these things in wow such as what abilities names are and values showing if its on cooldown and useable to check against. I don't know how to export something in PA5, but I could walk you through the process. Click the image under "Displays"
Change "Main Trigger" to "Spell Off Cooldown"
Change "Spell Name/ID" to "Mortal Strike" or "12294"
Click the gear to the right of "3: Unit Buff/Debuff" and change to "Spell Off Cooldown"
Change "Spell Name/ID" to "Clossus Smash" or "86346"
Click the gear to the right of "4: Unit Buff/Debuff" and change to "Spell Off Cooldown"
Change "Spell Name/ID" to "Overpower" or "7384"
Change "Trigger Operators" to "!1&2&!3&!4"
Feel free to go back to page 1 and change the "2: Player Status" options to whatever you want. Like put a check in "Combat" to require you to be in combat. Feel free to click on "Style" on the left to change the display looks and positioning. Untested, since my Warrior is only 71, but that should be pretty much it. Last edited by Caladia : 12-07-12 at 08:59 PM. Power Auras no longer seems to be able to "see" your Chi as a Monk after the 5.1 patch. Not really sure if this is the correct way, but it works. I have a feeling that there used to be an icon showing for the menu items but I can't find it, so this is the most straight forward way of fixing it. With these 2 changes my PowerAuras v5 RC3 is in a state that works well enough for me and saves me changing to another similar mod. Hopefully the authors or a new author take up the project soon. Edit: Because I stuck at typing and needed to fix typos. I looked back at older screen shot of the menu, don't think there was any icon displayed in the menu.